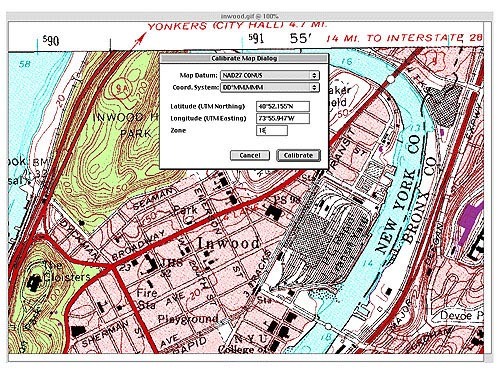 GPSyTM allows you to use both pre-calibrated as well as user-calibrated maps when navigating. In most cases, you will want to use pre-calibrated maps (ie, maps that come with their own calibration information) since pre-calibrated maps are almost always more accurately georeferenced than you could do yourself. For a list of pre-calibrated maps you can download off the internet, see our Map Resource Page . Sometimes, however, pre-calibrated maps aren't available. This is often the case when you only have the physical paper map of the area since no one has digitized and georeferenced it before. Or, there's a digital copy but it hasn't been georeferenced. Or, the georeferencing information was lost when resizing, cropping, or otherwise manipulating the image in a non-GIS aware application (like Photoshop). In these cases, you will have to "calibrate" or "georeference" (we use the terms interchangeably) the map. Calibrating the map tells GPSy how to read the map. By giving GPSy the coordinates of three known positions on the map, GPSy can extrapolate the coordinates for the rest of the area (by making some assumptions of the linearity of the coordinates, more on this later). Once you calibrate your map in GPSy, you never have to do it again. This tutorial will walk you through calibrating a map. 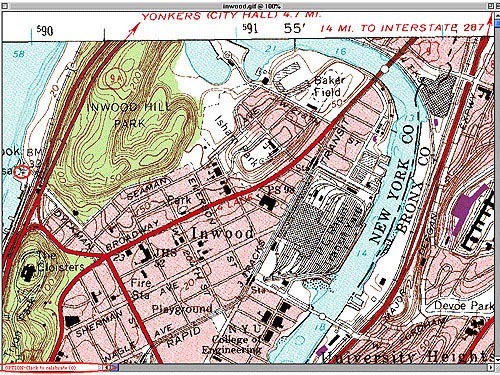 The original map was "New York City, Central Park Quad, USGS topo map file number/name o40073g8.tif" . We cropped it to a neighborhood in north Manhattan (Inwood) . The original map came with calibration data in the form of a ArcInfo TFW file, but since we cropped the Inwood portion, we must manually calibrate it since TFW calibrations don't work with subsections of a map. The original calibrated USGS map, as well as the Inwood subsection that we're using for this tutorial can be downloaded from FTP if you want to follow along. The original calibrated USGS map, o40073g8.tif , as well as the Inwood subsection that we're using for this tutorial can be downloaded from FTP if you want to follow along. First, I note down the coordinates of three points from the original calibrated map. This is the easiest way to get accurate coordinates. If this option isn't available to you, then another easy way to get accurate coordinates is by using the corner "ticks" or edges of the map or the intersections of the latitude/longitude lines. The calibration points should form a large isosceles triangle for a most accurate calibration. The first point is a mark at "sewage disposal". This point I copied from the original calibrated map (40 52.15'N 75 55.95'W). 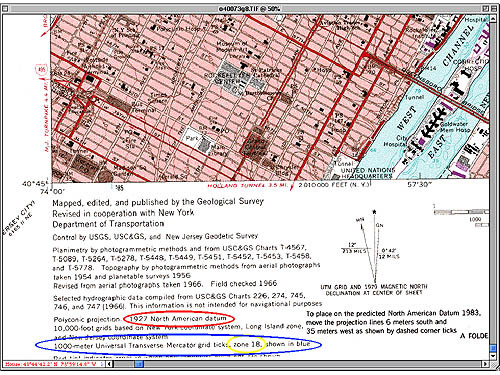 The second point is also copied from the original map at "Rapid Transit Yard" (40 52.077'N 75 54.142'W). The third point is a map coordinate marking at the top center of the map (40 52.05'N; 73 55'W). The Datum and Zone of the map must also be know to do the calibration. On this USGS map they are found in the lower left corner in the title information; the datum is circled in red, the zone in yellow. Within the blue circle is information pertaining to the blue margin marks. We will use these marks to verify our map's correct calibration. Before I enter in the calibration points, I make sure GPSy and I are using the same datum and coordinate display systems. In the Display Preferences panel, I set my Primary Display Datum to NAD27 CONS since that is the datum used by the map. I use DD MM.SS for convenience. Setting the right datum and coordinate system can be confusing to many people. It's important to set these correctly since they establish the basic units of measurements. Both the Global Positioning System (GPS) and GPSy use the WGS-84 datum. This datum, devised by the U.S. military cartography unit, is one of the most accurate models of the earth's spherical shape. 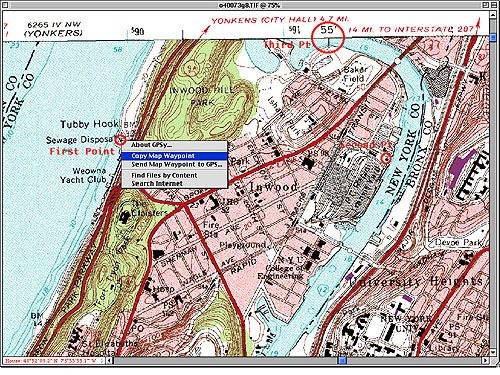 It's also convenient since it's easy to convert from WGS-84 to any of the older datums currently in use -- for example, the NAD27 datum which is used on most USGS topo maps. Just remember that internally, GPS units and GPSy use WGS-84. They then convert the WGS-84 coordinates into your local datum. You can set this in your GPS unit using its options menu. You set it in GPSy under the Display Preferences panel. Just be sure to have both set on the same setting and you won't get confused. Sometimes, although you're using a map that was originally charted using NAD27, you might want to use a different datum or coordinate system. Say for example your rescue service decides to modernize and move to using UTM coordinates set on a WGS-84 grid, for convenience and accuracy purposes. You can still use your old NAD27 maps in GPSy. 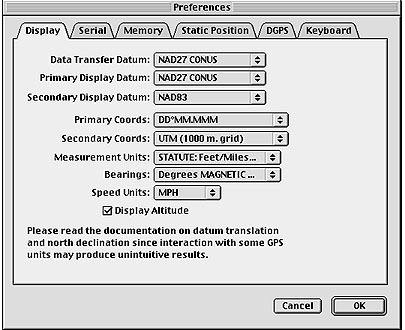 Just calibrate them in NAD27 and then re-set GPSy's display preferences to display the map using UTM coordinates in the WGS-84 system. When an uncalibrated map is opened, the status in the lower left corner reads "OPTION-click to calibrate (0)". This indicates that the map is not calibrated, and is waiting for the first calibration point. I choose my first known point with "option click". In the dialog I enter the datum, the coordinate system, the longitude/latitude from my saved notes, and the zone. The second and third calibration points need only the longitude/latitude entered. The map is now calibrated; when I Save Calibration the calibration file for the map is saved. It does not have to be in the same folder as the map nor have a similar name. So I can save it as "Inwood Map Calibrations" rather than o40073g8. To open the calibrated map next time just open this calibration file. I am using one of the map's 1000 meter UTM ticks in blue to confirm the calibration. Note the coordinates in the bottom left window match the tick coordinates, 0590002 4525216. The calibration algorithm in GPSy assumes rectilinear/proportional spacing in the map. 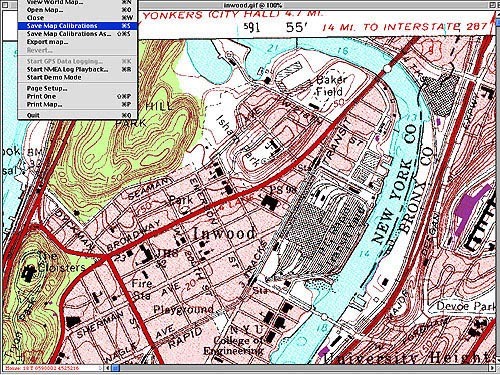 It works best with large-scale (close-up) maps that aren't skewed or distorted in any way. USGS topo and other maps set to the UTM grid are "ortho rectified" in this way and are ideal. Whenever possible, scan the map so that latitudinal and longitudinal lines are perpendicular and as close to vertical/horizontal as possible. GPSy ProTM allows you to use more than 3 calibration points and uses an algorithm that can properly account for map skewing, distortion, and different projection systems. To use more than three points in GPSy ProTM simply continue to choose calibration points using "option click" during the calibration process. Each additional point will be averaged into the calibration and fitted into a 10-coefficient polynomial that is one of the most complex and accurate in the industry and allows you to use skewed or distorted maps with GPSy ProTM . We've had hits since its creation on June 28, 1999. This page was last updated on June 28, 1999. A DS Creation.